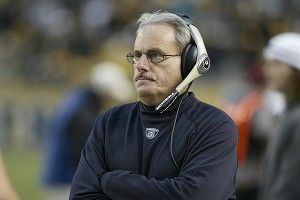 The New Orleans Saints have named top assistant Joe Vitt interim head coach during Sean Payton’s year-long suspension, despite the fact that Vitt will serve a six-game suspension of his own to start the season. During those six games, the Saints will be led by offensive line coach Aaron Kromer, who is serving a four-game suspension for watching cable television (Bridezillas, specifically) in the film room. For the first four games, Saints kicking adviser Marcus McCovey will take over, despite his two-game suspension for rhyming Sean Payton with “Sean Satan” in a Skype call with his daughter. The first two Saints games will be coached by New Orleans citizen Ernest Lambreaux, who is serving a one-game suspension for plotting to coach without a proper coaching license. For that first game only, Russian emigre and renowned castrato animal impersonator Gustaf Karpov will head up the Saints, though he’s suspended for a quarter because he won’t stop calling chocolate doughnuts “meatless pirozhkis” during strategy meetings. In the first quarter of the first game, the Saints plan to just fumble the ball and run into each other until someone dies. Reds reliever Alfredo Simon threw a wild pitch with two outs in the bottom of the 10th, and Ryan Zimmerman scored from third to give the Nationals a 3-2 walk-off win. “It’s the greatest win for Washington over the Reds since the days of my hero, Senator Joseph McCarthy,” said Marlins manager Ozzie Guillen, who really needs to just stop talking completely. Broncos receiver DeMaryius Thomas said he’s not sad that Tim Tebow was shipped out of town in favor of Peyton Manning. “I wasn’t getting no balls,” he said, “and you had to make some of these plays where some players were open and he is not making the throws, but I don’t want to talk bad about Tim.” When he heard the comments, Tebow threw a biblical temper tantrum, but it went way over Thomas’s head. did you say there was a raise in Detroit?” asked a really hopeful and heartbreaking old man with a set of dentures fashioned from a rusty hubcap. Sources report that UConn’s Andre Drummond will declare for the NBA draft. When he heard the news, UConn coach Jim Calhoun mumbled and broke an NCAA rule, and actually, nobody knows if he even heard the news. Matt Garza struck out nine over 8⅔ shutout innings as the Cubs battered Zack Greinke and the Brewers 8-0. I can’t think of a joke here, so it’s time once again for the ’60s song of the week. In honor of the Cubs, here’s one of the sadder-sounding songs of the decade, with a hopeful message: “Red Rubber Ball” by The Cyrkle, co-written by Paul Simon. In first-round NHL playoff action, the Rangers, Bruins, Coyotes, and Sharks all won to take 1-0 series leads. In other news, the NHL is thinking of changing the sport’s name to iced hockey, with a whole new letter, because what the hell? Canucks right winger Byron Bitz was suspended for two games for an egregious hit against the Kings Wednesday night. It’s a big blow for Vancouver fans, whose Stanley Cup hopes now depend on left winger Reginald Pieces, center Balthazar Bobs, and defenseman Alastair Kibbles. The turnout for the latest Readers’ Revenge has been pretty solid so far, but I would say there are still two or three slots up for grabs in Monday’s top 10. The topic this week is Your Worst/Most Shameful Lie. For more details on Readers’ Revenge, click the link. Otherwise, send your best story to tobaccordblues@gmail.com by Sunday for a chance at the big time. Anonymity is allowed, as are stories about third parties. Have a great weekend.